UPDATE - 9/23, 10:30 PM: Palmer Luckey posted a statement to Facebook in which he claimed he’s not a Trump supporter and instead plans to vote Libertarian. He said he contributed $10,000 to Nimble America because he’s “committed to the principles of fair play and equal treatment” and “thought the organization had fresh ideas on how to communicate with young voters.” He also said he did not write the infamous ‘NimbleRichMan’ Reddit post, contrary to what The Daily Beast’s news editor claims Luckey said in an email. This afternoon, Superhypercube developers Kokoromi and Polytron announced that they’re canceling Oculus support for Superhypercube, which was upcoming. “We cannot tacitly endorse these actions by supporting Luckey or his platform,” they said in a statement. Insomniac Games, creator of top Oculus title Edge of No Where, told Kotaku in an e-mail that they “condemn all forms of hate speech,” adding that, “this behavior and sentiment does not reflect the values of the many Oculus employees we work with on a daily basis.” They did not respond to our question about whether Luckey’s support for a Trump-centric organization affects their interest in future Oculus-based products. 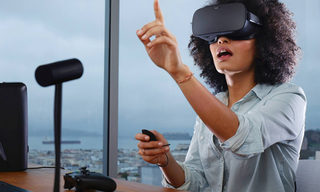 Oculus support is an integral part of several studios’ business models, and without it, their products may lose context. Straight-up pulling support could prove disastrous, or simply unfavorable, despite developers’ personal distaste for what Donald Trump stands for.